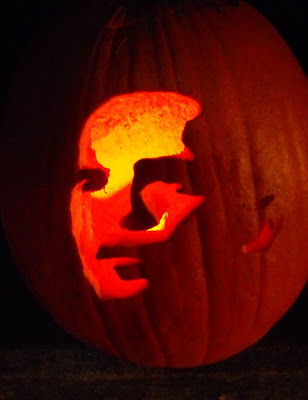 This pumpkin was among many that lined the bridge over near the Celo Inn. It wasn't easy, but here are some slides that I shot from a light table. Sorry for the bad slides, I took them myself in my apartment in Brooklyn, NY. Both of these pots were made while I lived in New York City with Stan's Anderson's earthenware clay body. I got the recipe from an issue of Studio Potter magazine devoted to earthenware. I also used his glaze recipe. The colors were mason stains mixed with water (I think). There's nothing quite as captivating as a spiral, especially several spirals, is there? haha. They were very popular in the eighties. As I had mentioned in a previous post, I was making pottery at the 63rd St. YMCA in a studio that was really a glorified closet. All throughout the YMCA building were earthenware tiles made in Spain, donated by the Spanish King in the 1930's (?). 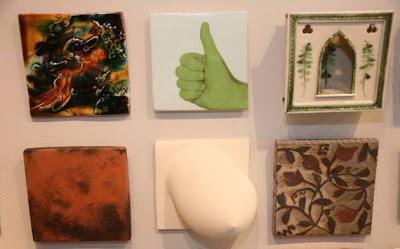 The swimming pool had tiles all around it, the cafeteria, where the clay studio eventually moved to, had walls and floors of hand painted tiles. It's worth a visit if you're in the neighborhood. I haven't been there in twenty years so I can't promise they are still there, but most likely. I was just beginning to use brushes and there was/is something about low fire earthenware that motivates one to use colr and decorate. 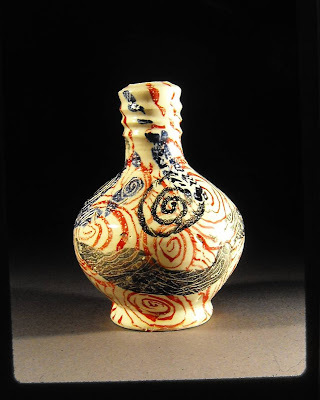 You rarely see 'atmospheric' earthenware. I not sure what it is. 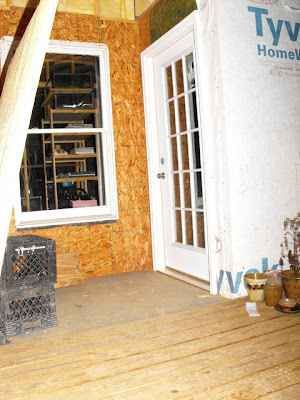 By some miracle I made my deadline of hoeing out the studio and we ready to sheet rock on Monday. I know there will be skeptics and there's nothing I can do to prove that this "after" photo is authentic and taken just minutes ago. Maybe I'll send this photo to the CIA and they can analyze it. You know, like those mysterious Bin Laden videos that pop up from time to time. Hey whatever happened to that guy? As Brandon Phillips would say, I digress. I left the heater in there, or should I say the "Mr. Heater", the stereo (of course), a couple of saw horses, and the ladders. Now I just need my lifter, some sheet rock, and some mud! Let's go to work! I thought that if I publish this shocking picture it would leave with no choice but to clean it up and show you a before/after picture. Then you might be amazed, right? Well, maybe not. Today started off pretty cool in low 30's, but at munch time it's about 65*F. Not bad. I've spent the better part of last night and all of this morning in meetings, Potter's of the Roan and Spruce Pine Potters Market, respectfully. 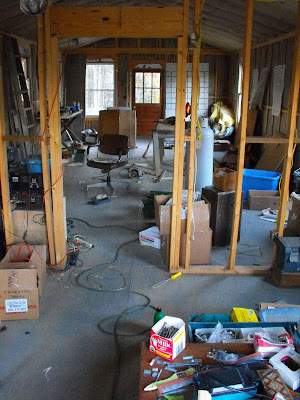 After I blog this, I'm moving all of the "stuff", to avoid using a more vulgar word (there may be children reading this after all) to other undisclosed destinations around the compound. I guess you could call it extraordinary rendition, or something to that effect. It's really a shame, but somebody has to do it. Then it's sheet rock time. I didn't want to use sheet rock, but my budget just doesn't allow a more expensive and aesthetically pleasing pine board wall. I've also just got to get' er done so I can get some clay on the walls! 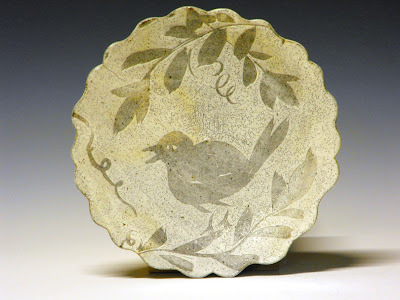 Florida potter John Tilton is an avid reader of this blog and has caught the blog bug! I first met John here in NC while he was visiting Tom Turner. We had a great lunch together, talked about blogs and making pots and I encouraged him to begin writing about his work with a blog. Here it is! Please see for yourself. 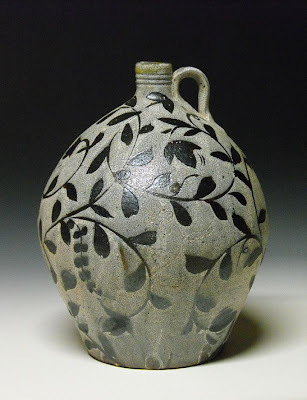 For the back story, check out his web site and read some of his essays, and his wonderful gallery of pots. Check this out, I want one! 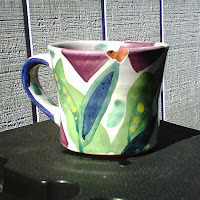 Many potters are writing about their work and their lives through the blog. It's an exciting time of sharing and camaraderie. 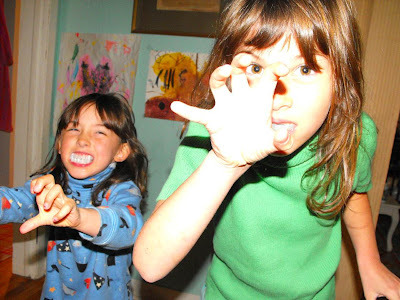 I can barely keep up with all the new potter bloggers out there, so forgive the long blog roll. Only the most recently updated blogs appear at the top of the roll. If you're looking for a particular blog it may be downlist as the blog roll updates regularly and it doesn't take long for weekly blogs to get buried. 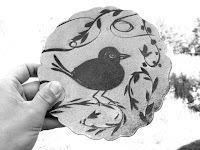 One of my favorite blogs, "This week @ St Earth Pottery", doesn't get updated automatically, but a link can be found at the bottom of the roll (sorry Scott), as well as here. 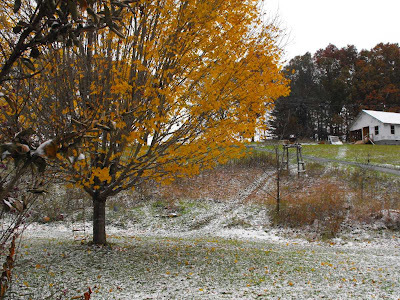 We woke up this morning to about an inch of snow, well maybe a half an inch. It's already melted quite a bit by the time I put on my snowshoes on to trek about the front yard to snap this picture. It wasn't enough to rev up my snow blower, which, BTW, sits ready for action even after ten years of sitting idle, talk about the patience, a snow blower in NC! Even this little amount of snow will keep the schools closed in these parts. 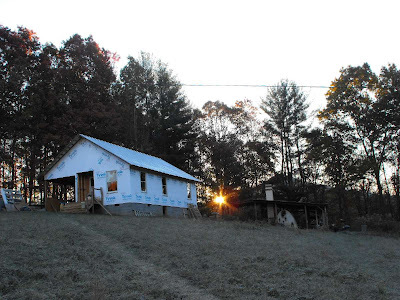 There are parts of the county that are at 4000 ft and conditions are often harsher there. So the girls are home from school, making snow cream and getting jacked on the maple syrup! It may be time to get off the blog and herd these wildcats! I better see to them. We may have to get some more maple from my friends in Worthington. Punch list will have to wait today. Sometimes "seeing" gets in the way of doing. This week I am back to punching out some minor details in the new shop. The walls have yet to be finished and I've been agonizing myself over wall treatments. I wanted to use pine boards for the walls but just can't afford it. I'm buttoning up the shop , replacing some broken panes in the old doors that Matt Anders gave me. It's starting to get pretty cool at night. Tonight/tomorrow morning is supposed to be in the twenties, so this door I installed yesterday will come in handy. I've been stapling up plastic to keep the cold wind out and that was getting real old. 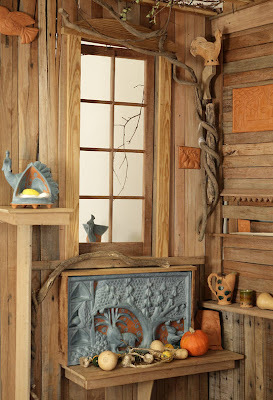 Here's a picture of the new door which you can add to your Sawdust and Dirt scrap book! My goal is to have the shop trimmed out and ready for the Toe River Arts Council (TRAC) December Studio Tour first weekend of December. Stacey will be showing off and selling her newest jewelry creations and I'll be selling big jars that you can put your 'kraut in (as well as this years seconds: cheap). But that means I need to bust it out for the next little bit so I can hit the ground running in the new year, er, I mean era! We got over to Terry Gess and Carmen Grier's place today for their home sale. I had the pleasure of meeting Becky and Steve Lloyd. Here is a nice set of pots by them. Steve does the throwing and Becky does the cutting. The pots are soooo delicate, this picture doesn't compare to picking one of thes pots up and turning it around. Beautifully integrated forms and surfaces. We had a nice talk and Steve told me that he went to school at Beloit College with my good buddy Sam Taylor. Wow, a small world! I look forward to getting down to Clyde to visit these folks. See their web site here. I just had to send this out to those who haven't seen this pot in the Potter's Eye [ISBN 0-8078-2992-7]. I don't have a close up of the bird in this jar, but you might be able to see the little bug that the bird is eye ballin' in the image above. The pot has really nice proportions and I love how the handles are tucked in high right around the neck. 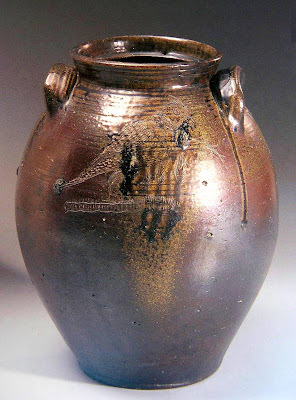 The ovoid shape of the pot reflects the makers origins in New England. 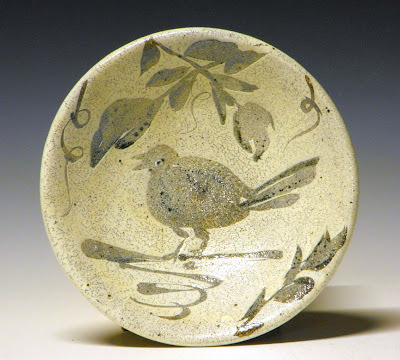 I first saw the Webster pots live at the NC Museum of Art in 2007 and the incising of these images of birds, fish, and botanica, really spurred me on to try my hand at similar imagery. I'm still trying, but haven't been as bold as to leave a mark like this, so stark and confident. No glaze, except for the natural ash and salt glaze. The clay color is so rich. 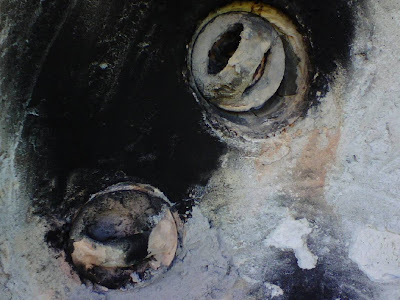 The surface worn by so many hands and untold uses, it is a beautiful survivor. Sunday noon update: For more info click on comments or here. The only story associated with this cup and this coffee break is that I had to make the coffee with a bag I found in some old box of stuff I brought over to the new shop a couple of months ago. It's not bad. Not the freshest, but it'll pass for this Saturday afternoon. It's become quite a nice afternoon (as you can see the blue-ish tint of the sky in this picture). I've had a couple of visitors to buy pots this afternoon, so I haven't done much except talk and wrap a few pots to send on their way. That's ok, but I'll have to give Stacey a call to pick up milk and COFFEE before she comes home this evening! Otherwise the waffles won't be nearly as good tomorrow morning. I hope the weekend is going well with everyone. 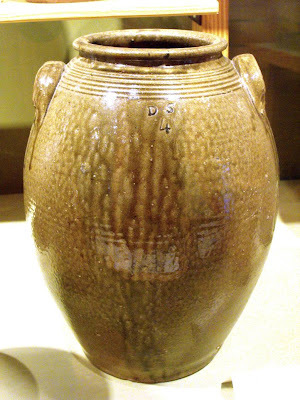 I'm still looking for those old slides of earthenware pots I promised last week. I haven't forgotten. It's just that everything is in a royal mess and stacks of boxes take time to go through. But no task is too great for you, my dear readers. Here's Terry's new sign! You will see it and all of the cars, I'm sure, parked along Wing Road this Saturday and Sunday during their home sale! 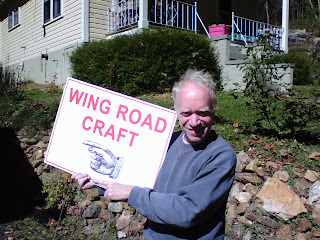 Here's my potter-neighbor Terry Gess, of Wing Road. 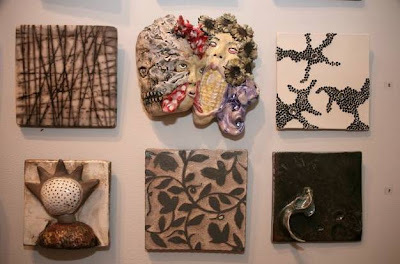 Terry and his wife and textile artist Carmen Grier, are hosting a craft show and sale at their home this Sat. and Sun. Oct. 25th and 26th. 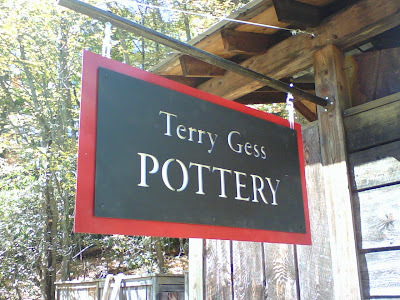 Terry just fired his salt kiln and will have some new-hot-out-of-the-oven 'signature' salt glaze stoneware. I'll fill you all in very soon! The Obamaware show will end at 8 P.M. EST tonight! That's less than an hour to get in on the auction action! I know that there will be some last minute/second bidding to get some good deals and that's ok. So far the sale has been a huge success- with over $4300 of work being sold at the Buy it Now option within the first few hours! The bidding going on with rest of the work is enthusiastic and vigorous. 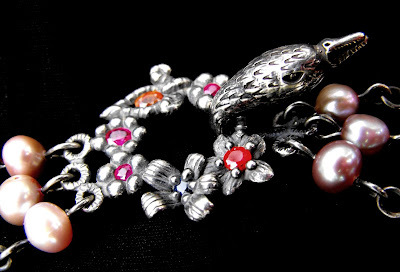 Amazingly, I think there are a few great pieces that can still be bought outright. Here is the link to my page where there are four pieces left for the bidding. Go get'em. Ouch. This cup has been really used and abused, but it still delivers. It's made by my fellow potter of the Roan and fellow former resident-artist who-never-left-the Penland community, Stanley Andersen. I first used one of Stan's mugs way back in 1984/85. That one belonged to someone I was staying with in Smithville, Tn. I was assisting at the International Ceramics Symposium at the Appalachian Center for Crafts and I must have used that little mug every morning during my one month stay, because even though I don't have that mug in my hand, it's in my mind's eye. It was probably half the size of this one, pictured. Stan is a master of the brush and has inspired me for a long time. 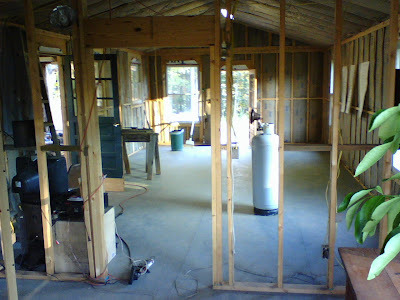 Well, the coffee's gone and I wired for more work on the new shop. It's a beautiful day, again, and I hope it is for you as well. 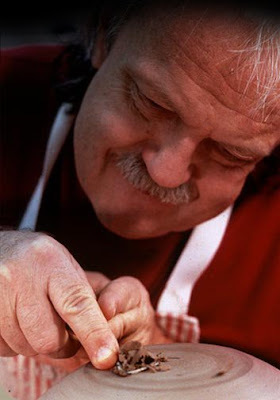 Thanks Stan for your great pottery and thanks to you, readers for checking in. Spy openings with thrown spy plugs in place. Joe Cole asked about my spy "plugs" and I sent him some pictures. I thought you, readers of "ye olde blogge", may be interested as well. After all the pictures are handy and inquiring minds want to know. The word spy,[ME, circa 1200-1250], has an intriguing allure, doesn't it? Well I guess you could say peeking, but spying is what we're doing when we look through one of these. We're definitely on the lookout, we're definitely keeping watch of the fire, the pots, and the cones. 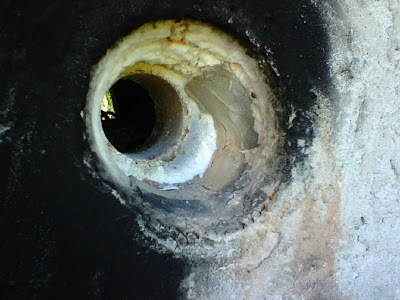 The main reason that I made these spy plugs is that when I built the arch form I decided to use 3" PVC pipe to create the voids in the form to be poured with refractory concrete. Since I was looking at Mark Peters' kiln as a model I did the same thing he did. I also thought they looked cool, too. I later found out that it was hard to find a single soft brick that could be cut to form a plug, and that gluing two bricks together didn't work after trying for the first firing. So for the second firing to the present I have used these thrown plugs. 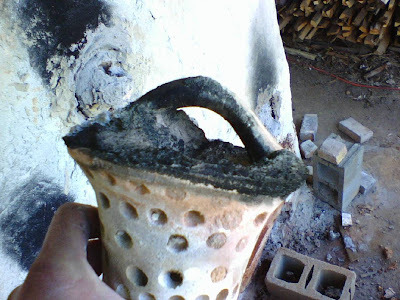 I don't remember what clay I mixed up, maybe fireclay, but I do remember putting a little bit of alumina in the mix, as well as sand, and a little sawdust. Side view showing the plug handle. After throwing the plugs I decided that a nice pulled handle would make it nice for pulling the plug. I have seen these types of spy plugs with a flange around the top edge so that it can be handles with a nearby stick, but that seemed too complicated, I guess. I love pulling handles so that is how I made them. The spy plug showing divets. I decided to use a drill to make divets so that the plugs didn't weigh so much, and then I filled the void the a little ceramic fiber. Once a plug broke during a firing and I scrambled to find something to use in its place. There happened to be a tumbler nearby that didn't make it into the kiln and I used that in the pinch. As a matter of fact I think it's still in the kiln in an unused spy hole. Since then I've made a couple of extra plugs to have around in case another one broke. But it hasn't happened. I guess that's it. If you have questions, I'm happy to answer. Just leave a comment and I'll try to get back to you. If you haven't registered with my commenting service, Disqus, do so and you will be alerted by email. Your email address won't be made public. Thanks for reading this obscure post. 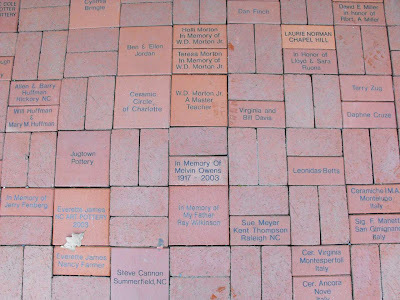 The entrance to the NC Pottery Center is paved with good patrons! 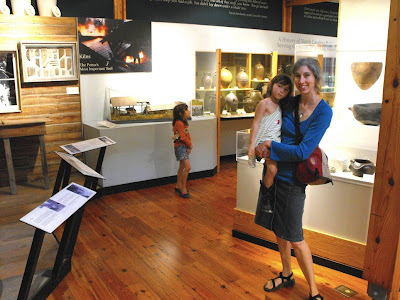 We visited the NC Pottery Center last week after a trip to the North Carolina Zoo. The girls were out of school for Fall Break and we decided to get out of our neighborhood and do a little camping. For two days we ran around the zoo in wonder of all the creatures, great and tiny, then for a day, we went to nearby Seagrove and visited some of my pottery cousins. We headed into the Pottery Center to hand deliver money from the purchase of one of my pots from the SPPM/NCPC benefit from last week. (FYI, the NCPC met it's fundraising goals last week!!! Thanks for all of those who helped out, here's that story.) 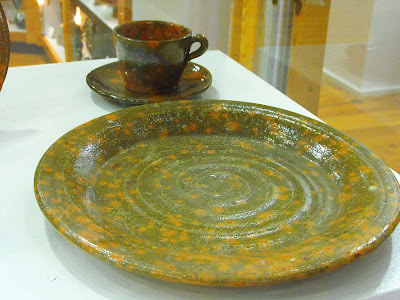 The current exhibit showed a variety of tablewares and tea and coffee sets of the early 20th century NC potteries. 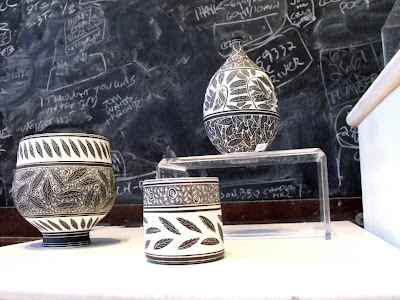 It was great to see these pots in a live instead of where I usually see them, on eBay. What a difference live viewing makes. I just wish I could just handle 'em and turn 'em over. The permanent exhibit is always great to see . I love those old pots. 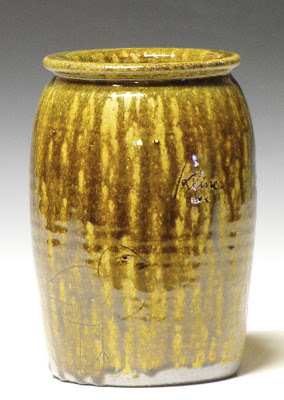 Here is a 4 gallon jar by the patron saint of the Catawba Valley, Daniel Seagle. Evelyn is at a great age where she is full of wonder, even with pottery! I gave up calling for her to pose with Stacey and Lillian. Here are a display of ribs, or known around here as 'chips'. Some of these don't look they were used very much. A couple of the small ones looked like they were worn down to the center hole. I know my wooden ribs get worn down pretty fast with my sandy clay, at least at the corners. We had a nice vist with Bruce and Samantha over at Bulldog Pottery. But Mocha, the bulldog was off napping, so we didn't get to play, maybe next time. We met Charlotte Wooten in town and saw here beautiful painted bird pots and then headed over to Ben Owen's place to see the "Papa-gama" as well as the museum which was a real treat. We were worn out and had a long trip ahead of us so we decided we'd better head for the hills to get the girls home at a decent hour. It's great to be able to have some time to visit the Seagrove are and see pots with the family. Who would have thought that visiting potteries would be so much fun for the family?! 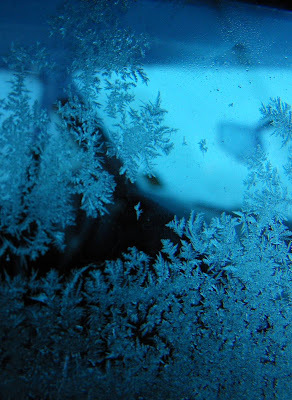 I'm still catching up on all of the blogs and will get back into the swing, myself this week. I'm looking forward to the Obamaware auction beginning tonight at 8p.m. on eBay. I hope you will get in on the auction that will benefit Barack Obama's and Joe Biden's bid for office. Bid high and bid often. The Obamaware '08 show has been moved to eBay to be able to handle to incredible response and prevent further crashes. The show will go live at 8 p.m. Sunday October 19th. Here is the address of the Obamaware auction! If you haven't registered with eBay, I would advise you do this early to be able to bid on Sunday night. 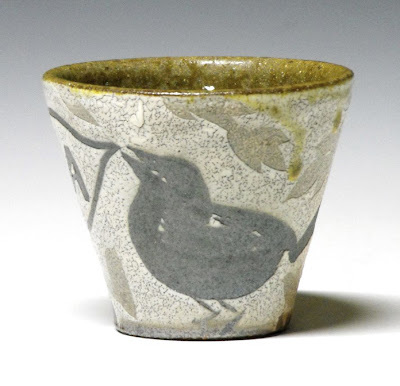 Lucy Dierks inspires me with the pots she makes and the birds that inhabit them. I hope you like this one, Lucy. It's coming your way in a little brown truck, soon! Lucy was the winner of the Disqus contest a little while back. You can see her work at her beautiful web site, here. Congratulations, Lucy! Despite Ayumi's web team's best efforts in anticipation for big traffic on the OBAMAWARE Preview and Sale, the upgraded server crashed last night. But it's UP today, Hooray. So check it out here. There has been a lot coverage here, extremecraft, at Ron's blog, and other blogs, namely Daily Kos. I've looked over the other pots, and the show looks great. I'm glad I pressed to get the pots made. It was a lot of fun to come up with new designs for what is a very limited edition. So check into the sale tomorrow and help Barack Obama's campaign at the same time. Ayumi Horie has assembled the Obamaware Preview here but I haven't been able to get on the site for the past half an hour. The response must be overwhelming the server. At some point you should go check it out. There are some amazing pieces that will go on sale at 12 NOON EST, Wednesday, Oct. 15th. You can sign up to be emailed when the sale is LIVE, here. The Obamaware Preview is now up! Browse now and come back for the Online Sale on Wednesday, the 15th at noon EST. Half of the proceeds will be donated to his campaign for president and many of the artists are making full donations. In almost all cases, the work you see for sale here are the only Obama/Biden pieces they've made and they're all limited editions. 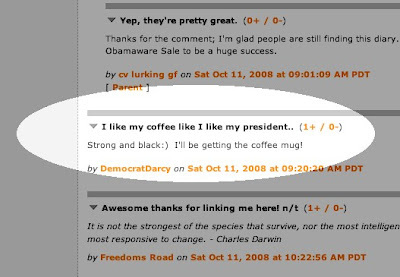 Sarah Archer, the director of Greenwich House Pottery, has also written an excellent essay called Kitchen Table Politics: 'Obamaware' Campaigns for Change One Mug at a Time. Since there has been so much interest in this sale, I would recommend creating an account now, if you don't already have one. If you have an existing account, to be on the safe side, please make sure that you can login with no trouble, because I changed servers last week in order to accommodate the new flood of traffic. I'm anticipating a huge wave of traffic as the sale begins. Keep in mind that pieces in your shopping cart are not sold until you check out. From now until Wednesday, nothing is for sale on the site, including my own work. The day was beautiful outside the Cross Street Building in Spruce Pine. The big windows of the old hosiery factory gave almost ample light on my pots and the crowd was there, against all odds. Maybe the banking news was so bleak in Charlotte, that many of its residents came running to the hills to buy pots, who knows? At any rate, S & D readers were there and I had a chance to meet a few today. 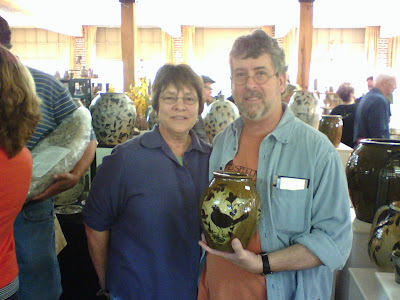 Here is Judy Shreve, a most frequent reader and commenter here, of Mountain House Studios with husband Bob with one of favorite pots of the last firing. They were in Asheville to check out UNC-A with their son. It was great to meet them. 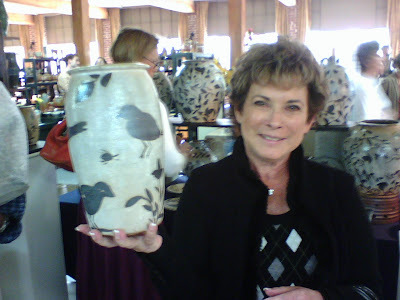 Here is another happy customer with the bird jar that she bought. 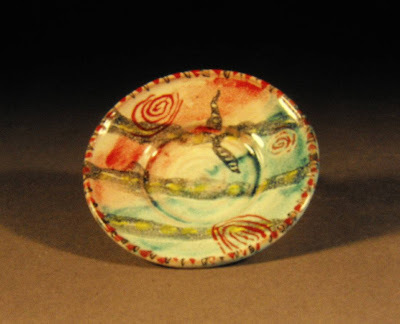 This piece was my designated donation to the NC Pottery Center. 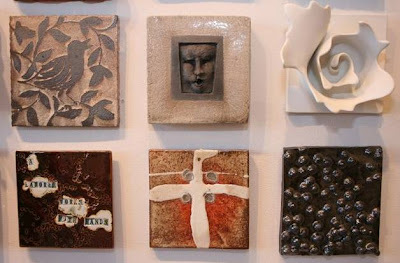 Most of the potters in the show participated in a benefit for the Pottery Center in Seagrove. The proceeds of this purchase will go to help the Center stay on top of their capital campaign. YAY, win-win. Against all odds, I'm packing up the pottery barge and heading up river to Spruce Pine for the Spruce Pine Potters Market. I will be setting up for the weekend show this afternoon and if you get there early enough on Saturday you might see this jug. I hope you will plan on visiting. If you have some lame excuse, like "...but it's all the way over that big pond!" or some such, maybe you can catch a glimpse here on ye olde blogge. Click on the link in the sidebar to the right for more info if you can make the trip. I've been sanding and grading the new pots. (sorry, no pictures of bad ones, yet) I have a few group shows to send pots to, not to mention the Potter's Market this weekend, and it helps to get the pots sanded before I start assigning their destinations. 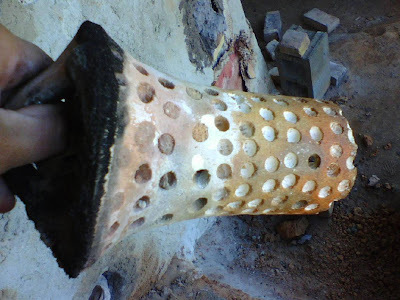 First it gives me a chance to "once over" the pots looking for imperfections, second I start to comprehend the firing while it's still fresh in my memory. 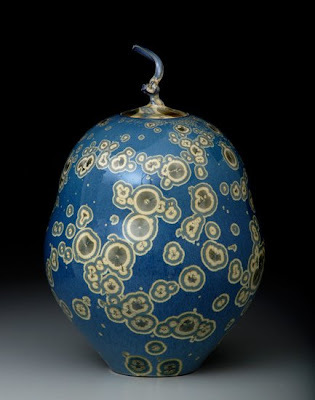 I make notes and put down the latest theories and speculations, so I can plan on my next firing(January?). So briefly I wanted to show these cups off because I felt that they are a departure and a new way to use the alkaline ash glaze. 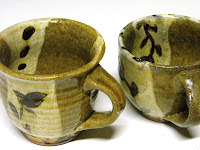 They are similar to the jars I showed yesterday with the dipped circle of white slip under the glaze, except in this case I just poured little bands over the sides of the cups and then painted a little vine on each one. 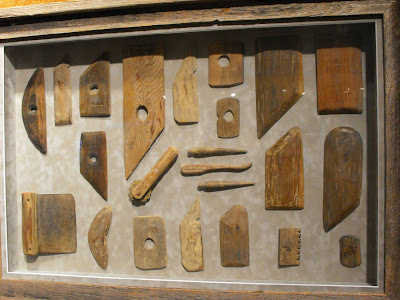 They remind me of my pottery cousin, MacKenzie Smith down Florida way and the way he treats the surface sometimes. The one on the left has a little trio of dots that I got from a bowl of Ron Philbeck's. I also like the throwing bands on the one on the left, something I usually rib out, before cutting off the wheel. They remind me of Japanese Oribe ware also...anyway, just wanted to flash these at you, then off to bed.